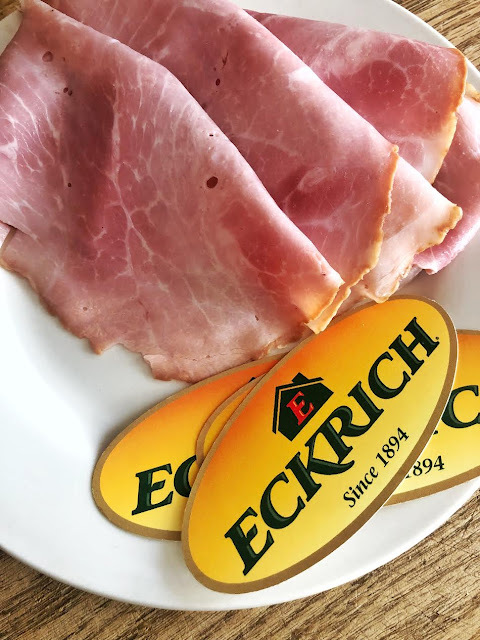 Thank you to Eckrich Deli Meat for sponsoring this post and helping us have a quick and easy mealtime! Life gets busy and for us right now, with J in grade school and M starting her second year of pre-school, it's busy for us! Back to school time gets pretty hectic with the schedule change and sometimes, by dinner, it leaves me not wanting to cook or in a hurry to put something on the table so that we can spend more time together as a family, find time to do homework, or so Trevon and I can make it to our various meetings on time in the evenings. For the really busy nights, I usually plan quick and easy meals that are easy to get on the table and easy to clean up. Eckrich Deli Meat has made some of those meals even easier, and I wanted to share a couple of those meals with you today. 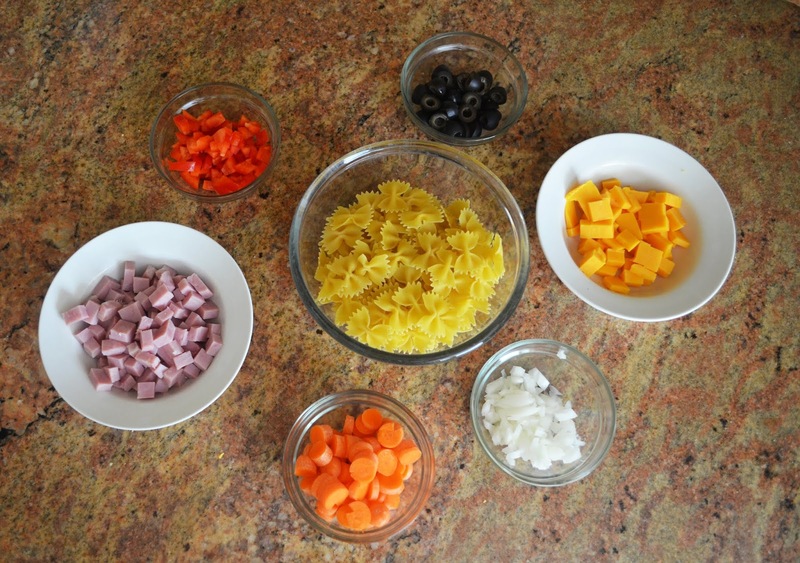 The first one is a super easy pasta salad! This can be a great side dish for a dinner, or by adding Eckrich Ham, it can be a really quick and filling lunch! 1/4 lb Eckrich Cooked Ham (classic ham taste), I asked the Walmart Deli to cut it about 1/2 inch thick so that I could cube it. Bring your salted water to a boil and add the pasta. While that is cooking, chop up your ham and vegetables. Once the pasta is cooked, drain it and let it cool. Meanwhile, mix your mayo, dressing, and mustard. In a large bowl, combine all ingredients and stir until everything is coated with the dressing. I love serving this as a side for a quick easy dinner, but I also love having it for my lunch or sending it to school with J for lunch. It's easy to make, easy to store in individual containers, and it travels well! 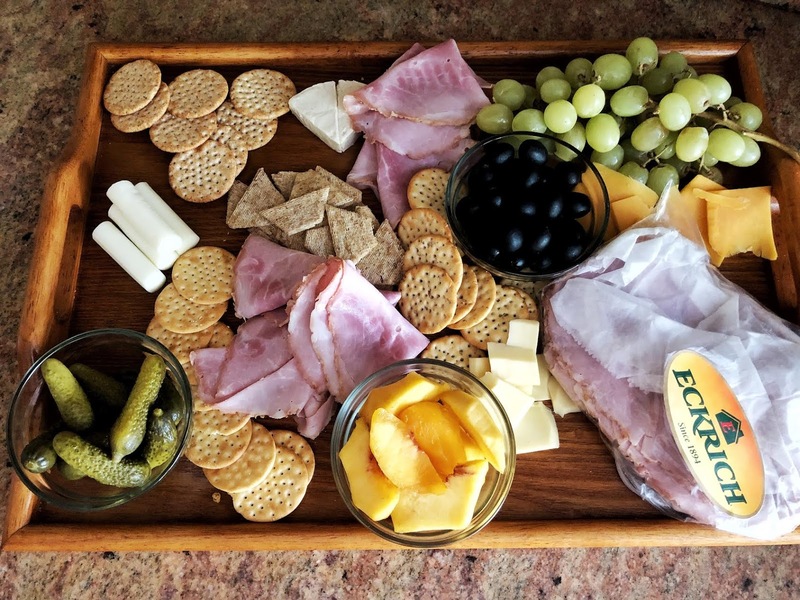 Another super easy meal to make with Eckrich Ham are these fancy meat and cheese platters all over the internet. It took me a while to actually give it a try because I'm not fancy, but I'm glad we finally did! I love making these meat and cheese platters for an after-school snack. 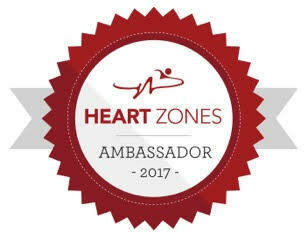 It's a better option for my kids (and myself) to snack on instead of the junk food that we would normally reach for. Because we’ve added Eckrich Deli Meat to these boards, this snack is easily turned into a lunch. It ends up being the perfect picnic lunch too because it travels so easily! Don't you just love when it when you find a lunch recipe that is quick and easy and still has all you need to feed your family (even the picky ones)? I think lunch is probably my least favorite meal to make because we are always rushing to get it on the table and everyone wants something different and it ends up being un-filling so they are hungry an hour later. I love these platters because they are super easy to make, they look pretty to display in a way that doesn't require a lot of effort, and it was incredibly easy to pick all of the ingredients up in the deli section at Walmart! Cut cheese slices and fruit. Place everything on a serving tray. Enjoy. It's literally that easy to make this and it's so filling. Pick up some freshly sliced Eckrich deli meat at your local Walmart deli today! Thank you to Eckrich Deli Meat, who sponsored this post. All opinions are my own. What is your go-to after-school snack? I love making a fruit, cheese and meat platter fir a quick and east lunch or dinner! My go to lunch is either a baked potato or a cold cut & cheese sandwich of some sort. Easy peasy. Yep, lunch needs to be something easy for me or I don't eat well! I love cheese platters. I rarely make them but I love to order them in a restaurant. So perfect for a light dinner or lunch with a glass of red wine! I can't say that I have even noticed that on a menu, but they are perfect for light meals! Charctueries are my jam! I love them with honeycomb, nuts and pickled onions! 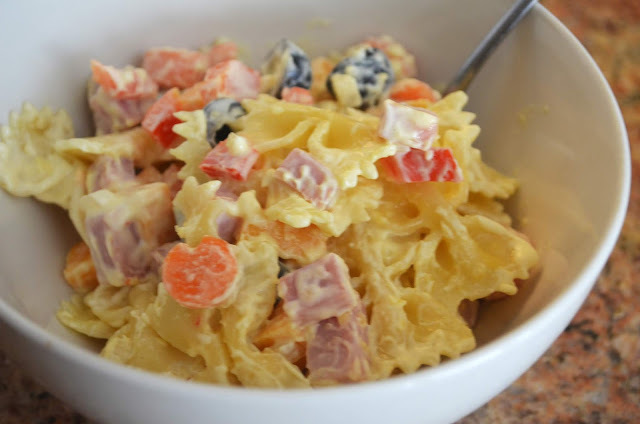 That pasta salad recipe sounds great! I don't eat pork, but I love that they have lots of poultry options. Thanks for sharing these great recipes! What great ideas! I never would have thought to put it in pasta salad.